HIDALGO — RGV Vipers coach Matt Brase entered Thursday’s game looking to see an increased focus and competitiveness from his players. In a tight playoff race, each game takes on added meaning, and Brase wants the Vipers to rise to that challenge. On Thursday, he saw that mentality only in spurts, but it was enough. RGV allowed the Santa Cruz Warriors to erase two 20-point deficits but held on for a 134-129 win at State Farm Arena. 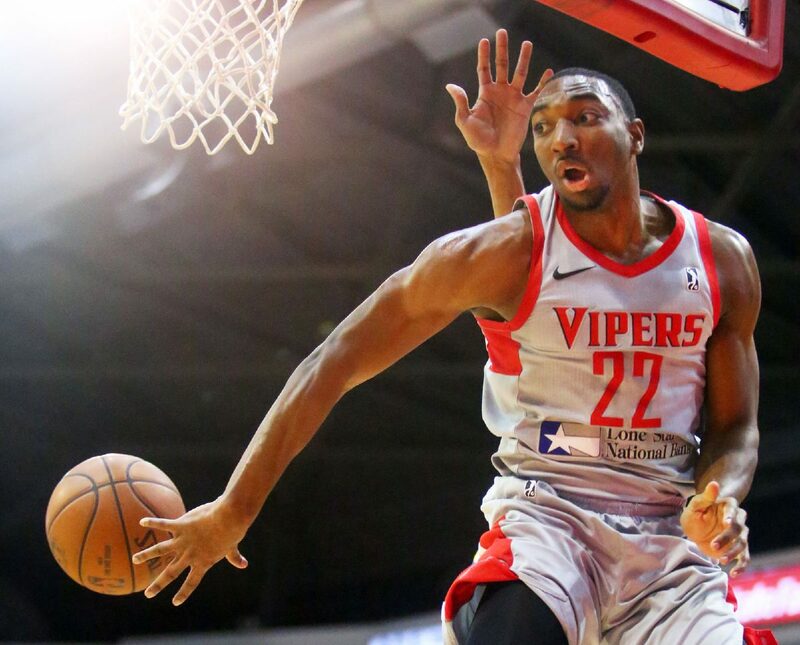 The victory gives the Vipers (26-20) a one-game cushion in the race to secure one of three wild-card playoff spots in the Western Conference with four games to play. RGV is tied with the Texas Legends (26-20) atop the wild-card standings, with Reno a half-game behind at 25-20. The Sioux Falls Skyforce and Oklahoma City Blue are deadlocked atop the Midwest Division at 25-21, and whichever team does not take the division title will fight for a wild-card berth. Rio Grande Valley Vipers' Tony Wroten (1) goes to the basket against Santa Cruz Warriors' Michael Gbinije (22) in a NBA D-League game at State Farm Arena on Thursday, March 15, 2018, in Hidalgo. Rio Grande Valley Vipers' Kevin Hardy (32) passes under the basket against Santa Cruz Warriors in a NBA D-League game at State Farm Arena on Thursday, March 15, 2018, in Hidalgo. Rio Grande Valley Vipers' RJ Hunter (3) drives to the basket against Santa Cruz Warriors' Jabari Brown (55) in a NBA D-League game at State Farm Arena on Thursday, March 15, 2018, in Hidalgo. 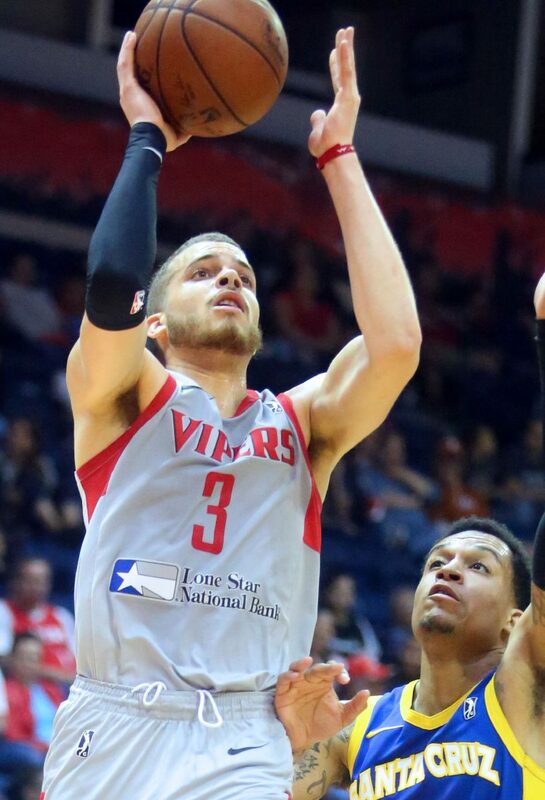 R.J. Hunter spearheaded the Vipers’ effort on Thursday with 37 points — the second-best output of the season for RGV’s leading scorer. Hunter scored 24 points after halftime but said he kept the same mentality from the first 24 minutes. Brase credited Hunter for his shot selection, as he connected on 13 of 19 shots for the game, including 7 of 12 from beyond the arc, with five assists and two turnovers. 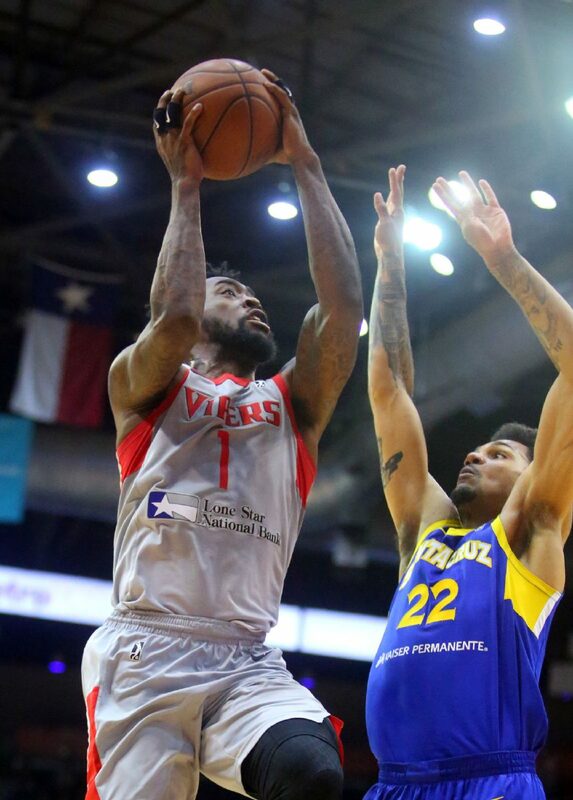 Houston Rockets assignment player Chinanu Onuaku added 18 points and 10 rebounds for the Vipers, while Tony Wroten netted 10 points with 14 assists — 10 before halftime — albeit with eight turnovers. Brase said Kevin Hardy was the “unsung hero” in the game, lifting the Vipers with his defensive focus and energy while posting six points, eight rebounds, seven assists and eight steals. Hardy played a season-high 31 minutes after entering the night averaging 1.8 points, 1.7 assists and 1.5 rebounds in 10.5 minutes per game. The Vipers opened up a lead as large as 22 points in the first half behind a blistering shooting performance — 29 of 41 (70.7 percent) from the field and 5 of 8 (62.5 percent) from beyond the arc during the first 24 minutes. “The best thing is we were getting to the rim,” Brase said. The Warriors started to crawl back midway through the second period, going on a 14-2 run across just 2:14 of game time to pull within six points. At halftime, RGV’s lead was 68-61. Santa Cruz continued to charge after the break, opening the third quarter with a 12-2 spurt to build a 73-70 advantage. RGV answered with a 16-0 run to once again take a commanding 15-point lead with 4:34 remaining in the third period. During the scoring burst that spanned 2:58, the Vipers forced five Warriors turnovers. RGV stretched the margin back to as many as 21 points in the fourth quarter before Santa Cruz again started to rally. The Vipers led by 13 with less than 2:30 to play, but the Warriors scored 10 straight points behind three RGV turnovers to pull within 126-123 with 1:21 remaining. The Vipers hit 8 of 10 free throws down the stretch to preserve the win. RGV returns to action against the Salt Lake City Stars on Monday at State Farm Arena, which hosted an announced crowd of 3,711 on Thursday.